Dealing with student loan debt? Not a problem with this program. Or, you’d like to use rental income from a basement apartment as part of your income for a mortgage? Or, do you need someone in your family, maybe your brother or sister, to live with you for a bit to contribute toward your monthly mortgage payment? Not a problem with the HomeReady program! Plus, you don’t have to be a first-time buyer either. Launched last month, HomeReady wants to reach those with moderate incomes and small savings that still have a solid ability to become a homeowner. Also it wants to reach communities that are designated low-income, minority or disaster-impacted and offer expanded eligibility for such areas. 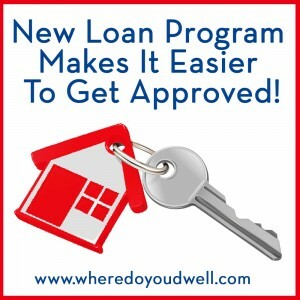 What makes this program more unique is its extra flexibility when determining your debt-to-income ratio and the sources of funds for your down payment, closing and/or monthly mortgage payments (i.e., parents or other family members). According to Fannie Mae, it’s “designed to meet the diverse financial and familial needs of responsible, creditworthy buyers.” A key goal of HomeReady is supporting extended families or multi-generational households so income from parents, grandparents, children, aunts, uncles can be considered when qualifying. Low down payment. Offers 3% down payment option for both first-time and repeat homebuyers. Up to 97% financing with many borrower flexibilities. Access to more sources of funds. Borrowers can have family members’ income used for down payment and closing costs with no minimum contribution from their own funds. These family members aren’t borrowers on the mortgage but their income will be used to determine debt-to-income ratio for the loan. Co-borrower flexibility. If your parents are co-borrowers on the mortgage they don’t have to live with you. Nontraditional credit eligibility. Those will little traditional credit history can supplement their files with a record of rental payments, utility payments, gym membership payments, and other monthly payments. Additional income sources. You can use rental payments as another allowable income source to help you qualify a buyer. That includes rental income from an accessory dwelling unit such as a basement apartment or a boarder within the same home. Income limits may apply. Various mortgage product options. Borrowers can have fixed rate mortgages (including 30-year or 15-year) or adjustable rate mortgages (such as 5/1, 7/1, 10/1 ARMs). Income limits vary. There are some income limitations for high-minority census tracts or designated disaster areas. Use the Income Eligibility Look Up Tool for more information. Homeownership education required. A $75 online course helps prepare you for the responsibilities of homeownership. Complete an online test and receive a certification of completion from the program’s partner, Framework. Borrowers also can have access to additional counseling before and after their home purchase. Contact us if you want more information on the HomeReady program to see if it’s right for you.